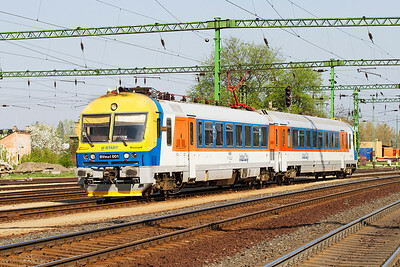 HUNGARIAN RAILWAYS (MAV) APRIL 2013. An excellent first visit to this country between the evening of Sunday 21st April 2013 and the evening of Friday 26th April 2013. Apart from some cloud on the Tuesday it was blue skies the whole time with the temperature reaching 30 degrees on the Thursday. Being of a certain age travel was free on transport in Hungary except for Intercity Train supplements. Managed to travel 506 miles by train for the princely sum of £2.06p! A wonderful trip with the excellent company of Brian Denton and Malcolm Collop plus good advice from Mark Bearton and Ferenc Joó. 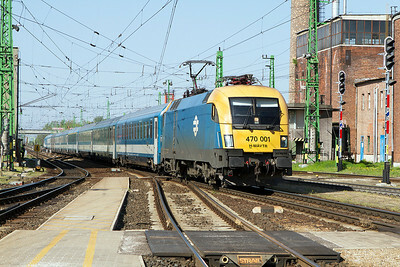 470 008 arrives at Györ with IC919 06.00 Szombathely to Budaperst-Keleti. Thursday 25th April 2013. 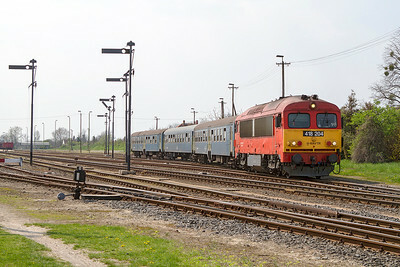 Flirt 5341 036 leads a sister unit into Tatabánya forming the 08.10 Komáron to Budapest-Déli. Thursday 25th April 2013. 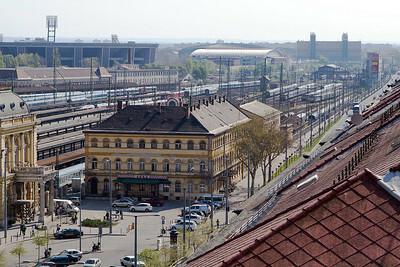 480 010 rounds the curve at Szöny with the 09.00 Szombathely to Budapest-Keleti fast dervice. Thursday 25th April 2013. 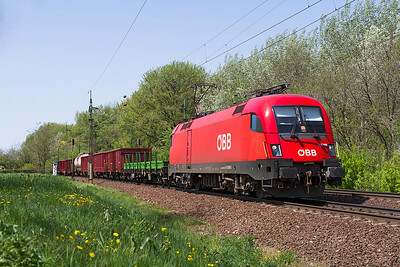 OBB 1116-019 heads a westbound Intermodal at Szöny. Thursday 25th April 2013. 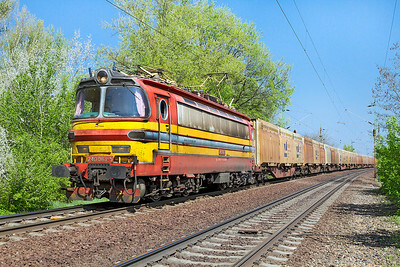 ZSSK Cargo's 240 088 heads a train of Innofreight containers westbound at Szöny. This is a PSZ working. Thursday 25th April 2013. 431 071 passes through Györ with an eastbound tank train. Friday 26th April 2013. 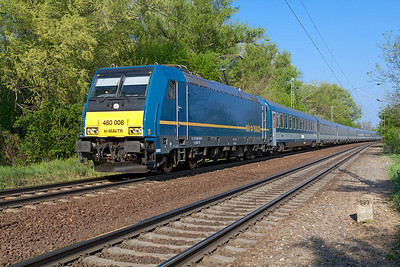 470 001 arrives at Györ with EN467 sleeper service from Zürich to Budapest-Keleti. Friday 26th April 2013. 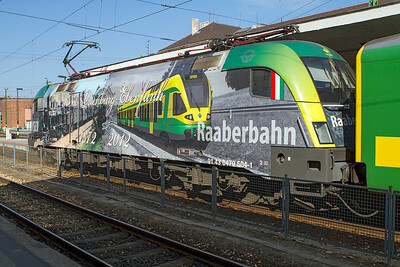 GySEV 470 501 with decals for 175 Anniversary of Queen Elisabeth heads a tank train westbound at Szöny. Friday 26th April 2013. 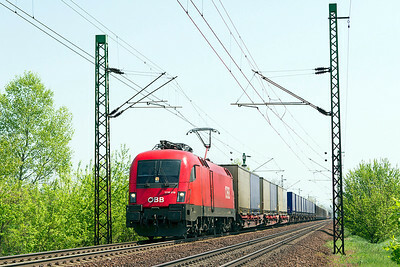 630 045 heads an Intermodal service westbound past Szöny. Friday 26th April 2013. 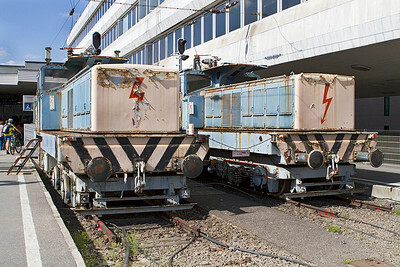 V10 & V11 built 1966 used as carriage warmers at Budapest-Deli. Friday 26th April 2013. 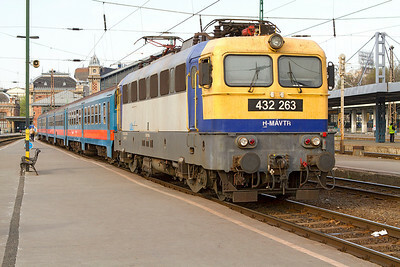 432 263 waits to depart from Budapest-Nyugati. Monday 22nd April 2013. 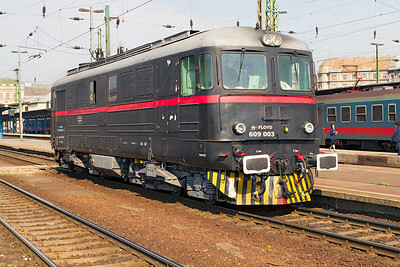 Floyd's Sulzer engined 609 003 waits to head away from Budapest Keleti light engine. Monday 22nd April 2013. Budapest-Keleti. Monday 22nd April 2013. 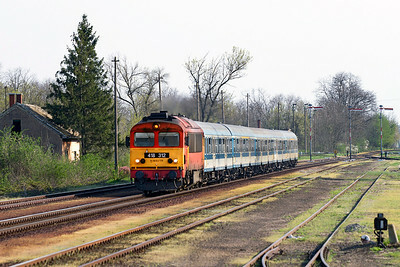 418 204 departs from Pápa with train 9225 the 12.55 Celldömölk to Györ. Monday 22nd April 2013. 418 204 passes through Gyömöre with train 9216 16.00 Györ to Celldömölk. Monday 22nd April 2013. 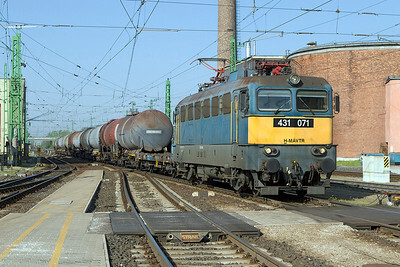 478 222 waits to depart to the east from the yard at Tatabánya with empty open wagons. Thursday 25th April 2013. 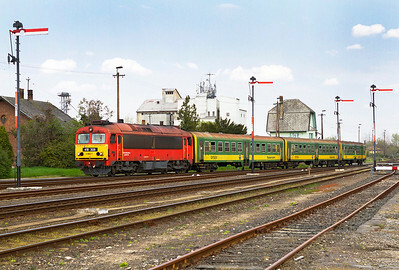 Class 5141 BVmot 001 'Varga Lásió' arrives at Tatabánya forming the 09.05 Oroslány to Tatabánya. This unit operates an hourly shuttle service between these two locations. 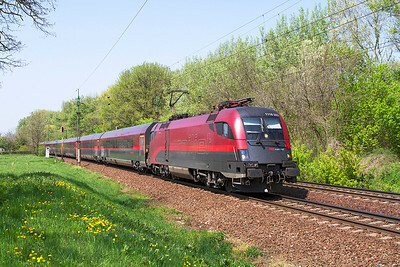 The unit was originally 4 cars and now reduced to 2 cars and operating in an InterCity livery. Thursday 25th April 2013. 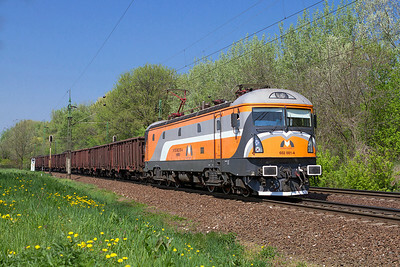 Magyar Maganvasut's (MMV) 602 001 heads east past Szöny with loaded coal. Thursday 25th April 2013. 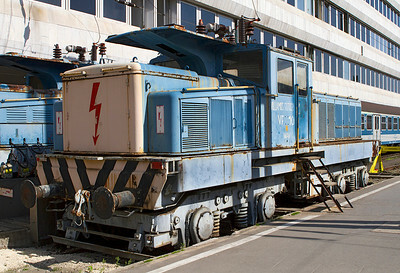 Softtronic prototype locomotive rebuilt from CFR 478-002 with new body design and equipment. 478 305 heads a trip freight past Szöny heading for Komáron. Thursday 25th April 2013. 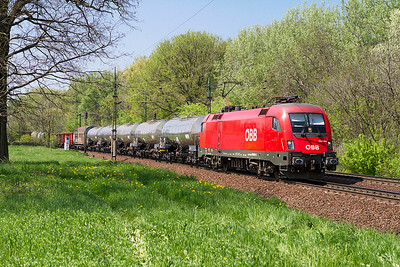 630 033 heads a short tank train west at Szöny. Thursday 25th April 2013. 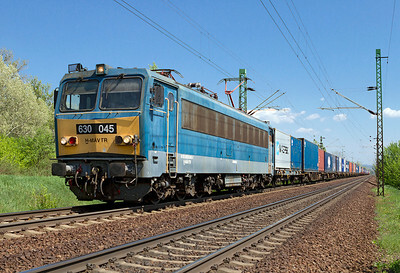 Wiener Lokalbahnen Cargo's ES 64 U2-064 heads eastbound through Györ with an Intermodal working. Friday 26th April 2013. 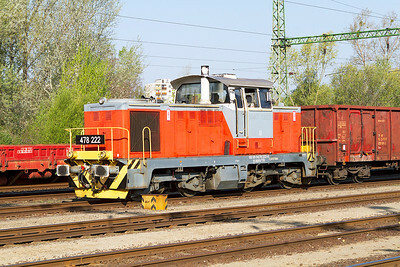 DB Schenker Rail Hungary's 469 100 shunts the yard at Györ-Gyárváros. Friday 26th April 2013. 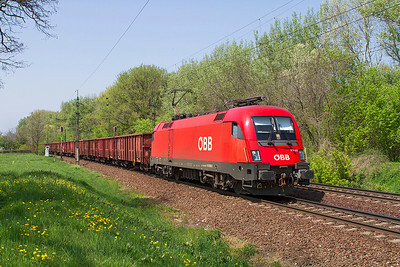 OBB 1116 013 heads a mixed freight eastbound at Szöny. Friday 26th April 2013. 480 010 passes Szöny with Train 9304 12.38 Budapest-Keleti to Györ semi-fast service. Friday 26th April 2013. 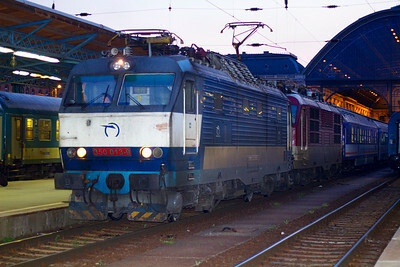 470 008 arrives at Budapest Keleti with the 16.21 from Sátoraljaújhely. Sunday 21st April 2013. 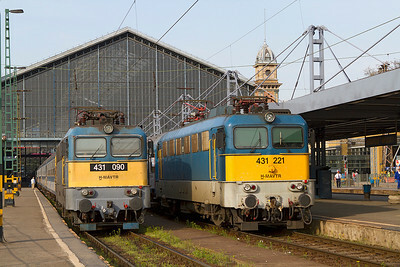 432 263 & 432 270 stand with departures at Budapest-Nyugati. Monday 22nd April 2013. CFR 477-895 heads away from Budapest-Keleti heading the return through working, train 373 to Bucharest, Romania. Monday 22nd April 2013. 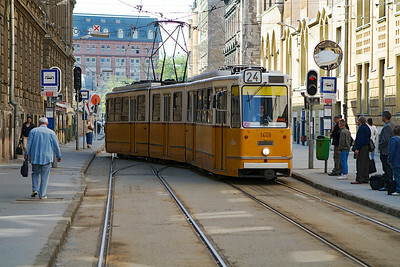 Tram 1408 arrives at the terminus of route 24 at Budapest-Keleti. Monday 22nd April 2013. 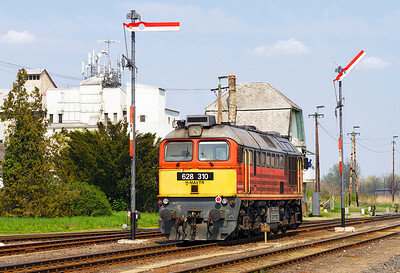 628 310 heads light engine through Pápa northbound to collect a steel train from the electrified main line. Monday 22nd April 2013. 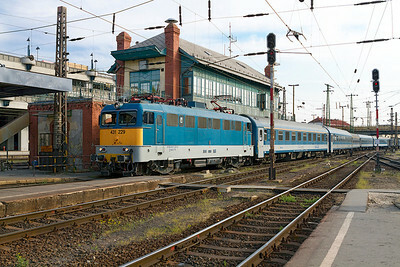 418 312 powers through Gyömöre with train 9203 15.07 Szombathley to Budapest-Keleti. Monday 22nd April 2013. 630 021 passes Tatabánya eastbound with Rail Cargo Austria hoppers. Thursday 25th April 2013. 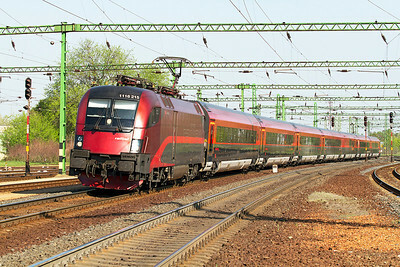 431 083 heads the Danube Express luxury train westbound at Szöny, Thursday 25th April 2013. 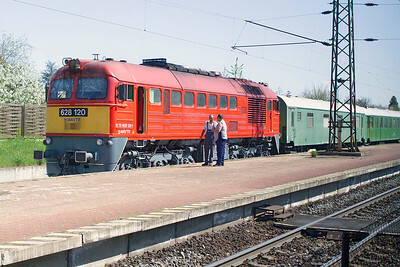 The train is formed of 2 Staff sleeping cars; 2 Sleeping cars rebuilt from former postal vans; 2 Dining cars and 2 further sleeping cars rebuilt from postal vans. 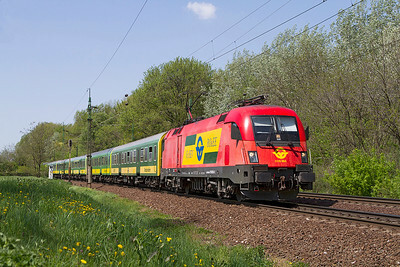 OBB 1116 014 allocated to RCH-MAV Cargo brings a mixed freight eastbound at Szöny. Thursday 25th April 2013. 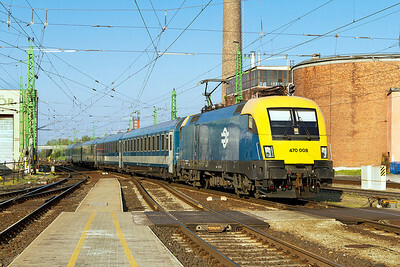 480 008 passes Szöny with the 16.10 Budapest-Keleti to Szombathely. Thursday 25th April 2013. 1116 220 arrives at Györ with Railjet service 41 from Wien to Budapest-Keleti. Friday 26th April 2013. 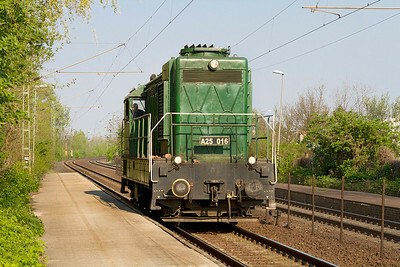 PSZ 468 002 waits in the loop at Györszentiván with a westbound tank train. 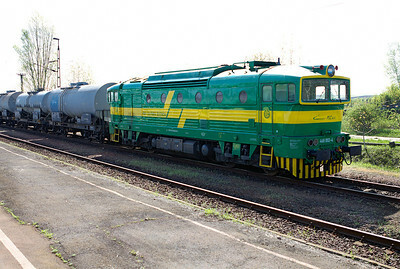 This is EX ZSSK 750 128. Friday 26th April 2013. GySEV 1116 065 heads train 9207 09.07 Szombathely to Budapest-Keleti semi-fast service past Szöny. Friday 26th April 2013. 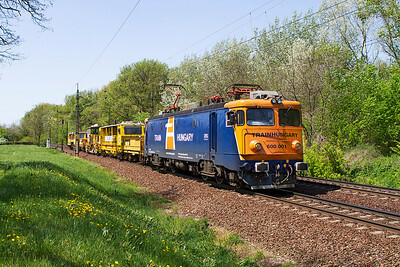 On track plant heads west at Szöny. Friday 26th April 2013. 350 013 & 350 002 await departure from Budapest keleti with sleeper EN476 to Berlin, Praha, Warsaw and Krakow. Sunday 21st April 2013. 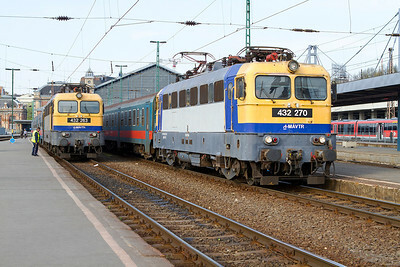 431 090 & 431 221 with empty stock trains from early morning arrivals at Budapest-Nyugati. Monday 22nd April 2013. 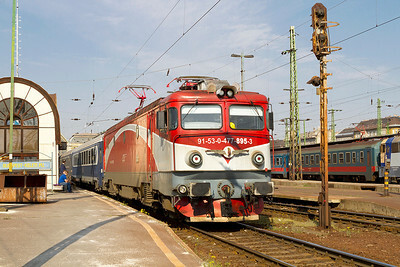 431 015 waits to depart from Budapest-Keleti with the 09.30 IC564. Monday 22nd April 2013. 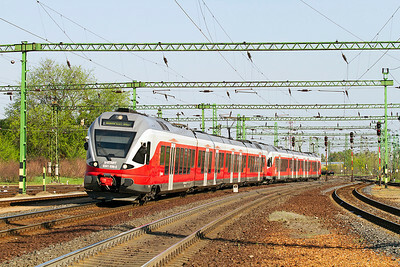 1116 205 propels the 11.10 Budapest-Keleti to München Railjet service into Györ. Monday 22nd April 2013. 418 308 arrives at Pápa with train 9224 the 13.51 Györ to Celldömölk service. Monday 22nd April 2013. 630 034 'Budapest-Ferencváros' heads eat through Tatabánya with a long Intermodal train. Thursday 25th April 2013. 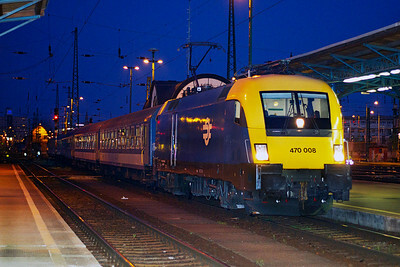 470 001 arrives at Tatabánya with the overnight sleeper from Zürich to Budapest-Keleti. Thursday 25th April 2013. 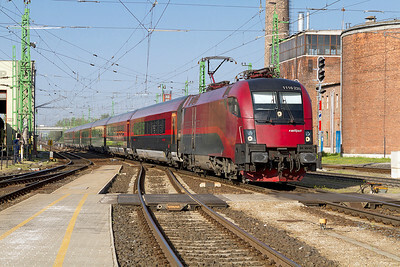 1116 203 passes Szöny with Railjet service 49 from Innsbruck and Wien to Budapest-Keleti. Thursday 25th April 2013. 480 018 heads the 12.38 Budapest-Keleti to Györ past Szöny. Thursday 25th April 2013. MAV Industrial shunter A25 016 now owned by MAV Nosztalgia Ltd passes Szöny heading for the fueling point at Komáron. Thursday 25th April 2013. 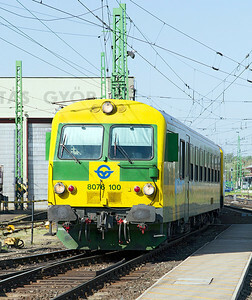 GySEV DVT 8076 100 leads a service into Györ with 470 504 providing the power. Friday 26th April 2013. 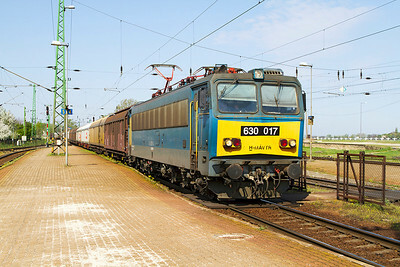 630 017 runs through Komárom with an eastbound freight. Friday 26th April 2013. 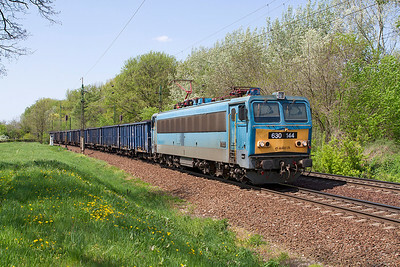 630 144 eastbound at Szöny with coal in PKP bogie wagons. Friday 26th April 2013. A very clean 628 120 sits in the loop at Tata with an engineers train. Friday 26th April 2013. 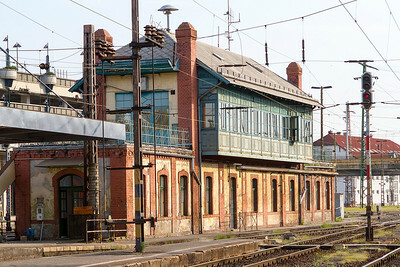 The very stylish signal box at Budapest-Nyugati. Monday 22nd April 2013. 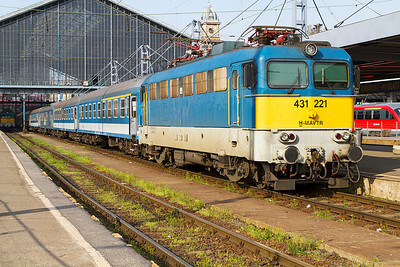 431 221 waits to leave Budapest-Nyugati with empty stock. Monday 22nd April 2013. 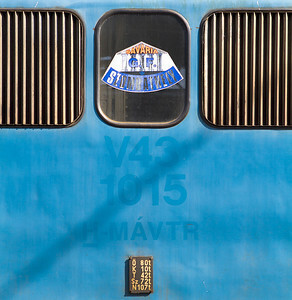 431 015 displays it's old number V43 1015 along with a sticker in the engine room window for Savaria Szombathely. Savaria being Szombathely's Roman name. 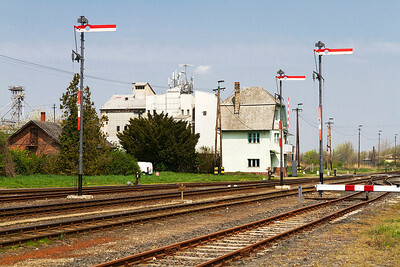 Semaphore signals stand guard at Pápa. Monday 22nd April 2013. 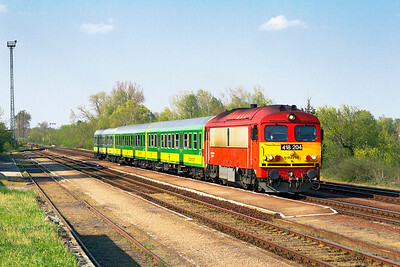 With train 9224 having cleared the single line 418 311 departs northbound with train 9205 14.08 Celldömölk to Györ. Monday 22nd April 2013. 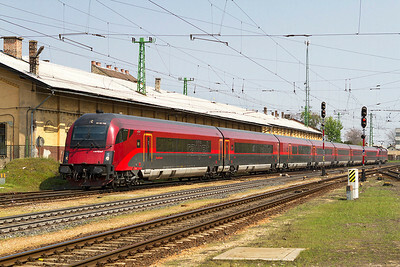 1116 215 arrives at Tatabánya with a Railjet service from Wien. Thursday 25th April 2013. 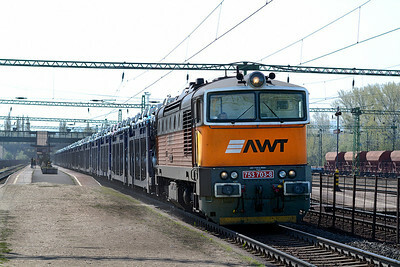 AWT's 753 703 runs through Tatabánya with westbound cars. Friday 26th April 2013. 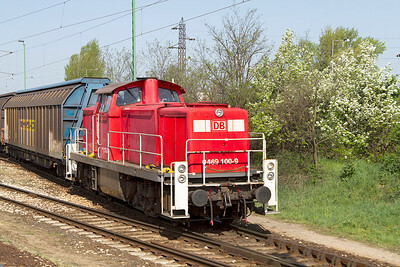 OBB 1116 008 allocated to RCH-MAV Cargo heads east at Szöny with bogie open wagons. Thursday 25th April 2013. 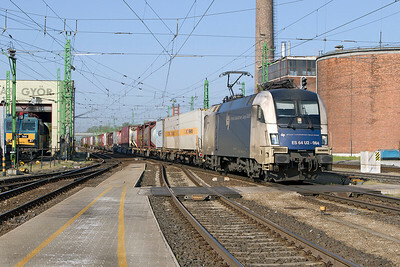 MRCE Dispolok's Taurus ES 64 U2-062 heads westbound with a partially loaded Intermodal at Szöny. Thursday 25th April 2013. 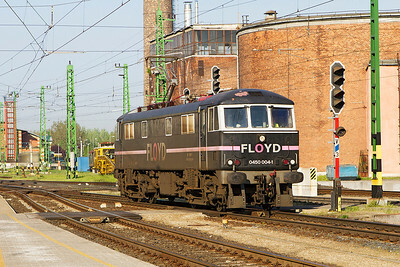 Floyd 0450 004 Ex 86 218 runs light engine into Györ. Friday 26th April 2013. GySEV 470 504 with decals celebrating 140 years of GySEV at Györ. Friday 26th April 2013. 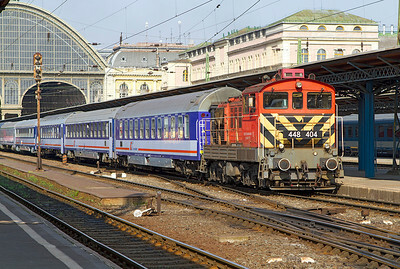 480 012 leads IC917 09.00 Szombathely to Budapest-Keleti past Szöny. Friday 26th April 2013. 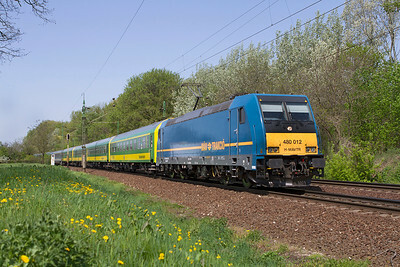 Train Hungary's 600 001 tows on track plant eastbound at Szöny. Friday 26th April 2013. 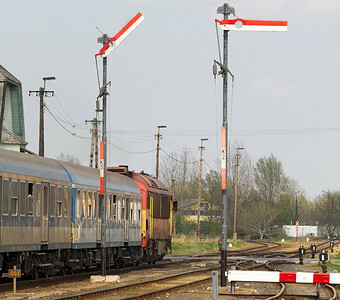 431 229 arrives at Budapest-Nyugati past the signalbox with IC709 from Szeged. Monday 22nd April 2013. 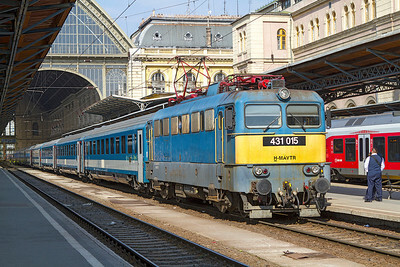 448 404 removes empty stock from Budapest Keleti. Monday 22nd April 2013. 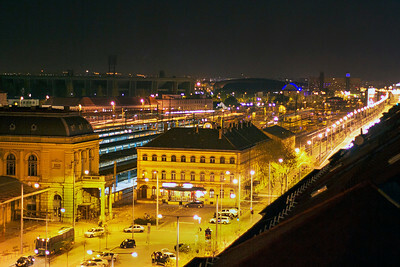 Budapest-Keleti. Sunday 21st April 2013. 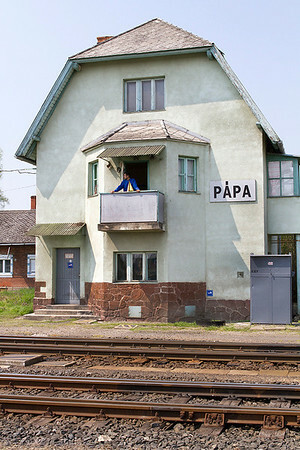 The signalman at Pápa watches a departure from his signalbox balcony. Monday 22nd April 2013. 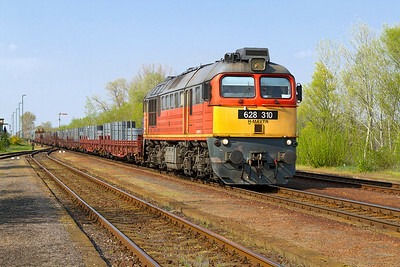 628 310 returns southbound through Gyömöre with a loaded steel train. Monday 22nd April 2013.